Over Easy Lake House is a newly-constructed cabin atop a beautiful wooded hill, with personality plus! 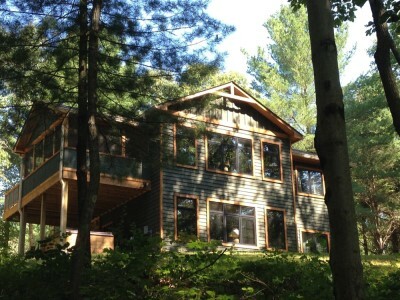 This newly-constructed cabin is secluded and serene in its peaceful, wooded setting. The sparkling 1-1/2 acre shared lake beckons anyone who enjoys throwing in a baited line for some catch & release fishing, or an invigorating hike around the lake, or through the woods. A small front porch leads the way into the foyer, where you’ll instantly feel welcomed by the owners’ thoughtful attention to your every need. The entire cabin has been furnished with comfortable furniture, and lots of unusual pieces gleaned on antique-ing forays. The gas-log fireplace is the centerpiece of the great room, and an inviting spot for gathering with your besties to chat, laugh, or share a meal around the table for eight. Custom-built cabinetry in the kitchen features wood counter tops, stainless steel appliances, and plenty of dishware, cookware, and utensils to handle the crowd. Just off the great room is the screened porch where you can catch a breeze as you deal the cards or attend the charcoal grill on the adjoining deck. The fire pit and lake are visible from the porch and deck, as well. Be sure to inspect the Willy’s jeep front that has been upcycled into the oh-so-cool porch lamp! And speaking of the unusual…bet you haven’t seen a mounted moose head quite like the one on the porch! Two bedrooms and one full bath are on the main floor. Stake your claim for either the king bed, with its antique door transom that’s been repurposed as a headboard; or the queen bed with an equally interesting vintage oriental screen headboard. Carpeted floors in the bedrooms provide cozy comfort for bare feet on a chilly morning, and the walk-in shower in the bathroom is handy for all. Downstairs, you’ll find two more nice bedrooms, similarly outfitted to the upstairs bedrooms… (one king, one queen). The bathroom on the lower level has a standard tub/shower combo, so that bathing the kiddos is a simple task. If your vacation wish list includes playing some pool, you’ve come to the right place by choosing Over Easy Vacation Home. A nice pool table, a bar with stools, a table for snacks and games, and another gas-log fireplace completes the downstairs area. A vintage outboard motor is an amusing bit of man-cave décor, and other water-related elements like fishing stuff and skis make this level a fun spot to hang out. Access to the steaming hot tub is through the door in this family room…and it’s guaranteed to soothe the achiest joints, so bring your swim suit and jump right in! Sharing the front part of the same property is one of our sister cabins, Big Easy Log Cabin, and our wedding venue, The Old Barn at Brown County. While the two cabins are both located on the same 52 acre property, neither house is visible from the other, so your privacy (except shared lake) won’t be interrupted. The fact that the cabins share the same property is very handy for families or group of friends who desire two cabins being fairly close together. *Please note that due to the long and steep driveway, it is recommended that you bring your all wheel or 4 wheel drive vehicle, and leave your shiny little sports car in its cozy garage bed at home. It may sulk a little, but you can always show it some pictures on your phone. Please come and stay at the Over Easy cabin and we are sure it will be one of your favorites. And if you have a large group, rent the Big Easy and the Over Easy cabin together and they will hold up to 16 people. Big Easy: Our 4BR Sister Cabin. Sanctuary: Our 2BR Sister Cabin. Maple Hills: Our 2BR Sister Cabin. Hop Skip & Jump: Our 2BR Sister Cabin.